January 31, 2016 ~ Sara W.
You know those moments where someone says something that’s so simple you can hardly believe you didn’t piece it together before? I can think of one such moment off the top of my head, which happens to be another scriptural reference, this time from the Holy Bible. I remember someone once teaching from this scripture and pointing out that the storm comes upon both people. It doesn’t say that the wise man doesn’t get a storm because he built his house upon a rock, his home simply remains standing regardless of the storm. Well, duh, Sara, obviously. Not so obvious for me, back in the day. I somehow managed to skip the significance of the storm coming upon each of us regardless of our desire to follow Christ. Though, I was certainly aware that I was not living a trial-free life. It was just one of those moments where it opened up a greater understanding between the scriptures and my daily life. Well, that was the case again today. 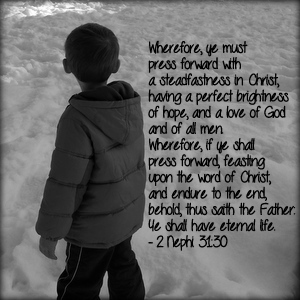 When the speakers referenced the “press forward” scripture, they each focused on the significance of those words. They pointed out that pressing forward implies opposition. Well, duh, Sara, obviously. But I needed to hear it broken down in that way. I needed to hear that it’s not just about being steadfast in Christ, or having a perfect brightness of hope, or a love of God and of all men (though these are important). Sometimes it’s about pressing forward. It’s about pressing forward so that you can do all those other things that are asked of you. It’s about standing up against opposition in all parts of your life. Ironically, the thing that is standing in the way of me, as of late, is me. I need to push back on myself. I need to force myself to do something that will edify me or those around me, even if I just feel bored with it all. Honestly, I have this list of things To-Do on my Task List app where I’ve started to ignore the first three items on the list. They’ve been on there so long that I don’t even acknowledge them as things that need completing. It’s pathetic. But it’s not just about items on my To-Do list, it’s about living life to the fullest. I need to press forward against all the many ways that I am holding myself back. Coincidentally, as I was looking on my website for other posts where I mentioned the beauty of said Task List app, I found mention of it within my post Six Ways to Get Motivated. I’ve been steadily accomplishing items #5 and #6, but it’s time to amp up my game on the first four ways to improve my efforts in pressing forward. As always, I would love feedback from your personal experiences. What motivates you to press forward against the opposition in your life, whatever it may be? I know, for me, managing to complete a post (I have several unfinished ones in my queue) has actually lifted my spirits this evening. It may be a small accomplishment, but it’s an accomplishment nonetheless.